Mr. LeDeaux, you have made many good points. However, the issue that I would like to underline is that it appears that your piece is advocating adding “behavior” to the child’s curriculum as a course to be taught along with Language Arts, Math or Science. That is draining for a teacher. An assistant principal may have the privilege to get involved in a student’s life in a nice way, and there again, as you yourself have found out, it is very difficult to keep up. We cannot play a parental role, as teachers, when we are overrun with IEP’s and ISP’s and with the responsibility of teaching those who do want to learn and would restrain their bad behavior in favor of the learning benefit. 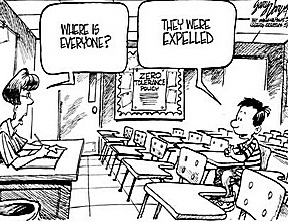 It does occasionally get absolutely frustrating when one student will spoil it for all others. While a teacher can pour himself (or herself) into a student occasionally, It is almost foolish to think one can curb bad behavior in a classroom by teaching behavior along with the said subject. Having said this, I am also acutely aware that some bad behavior stems from a lack of social skills and from immaturity. In such cases, as a teacher, I make it my duty to mentor my students so that they could improve on their social skills, and I use paternal patience to allow them to mature. However, I have been in situations where a stubborn student needed to be removed from the environment in order for me to help the others succeed. Strangely enough, those individuals I forcibly removed from my classroom have come back to me months later to thank me for standing my ground. When they finally matured, they realized that I did what I did out of love also, and not of personal frustration alone. Thanks for sharing. Thank you for reading and for the response, IRonMan! Valid and legitimate points! It is accurate to say I firmly believe in teaching behavior to our kids; however, not as a class. It is done so with the intentions of your actions seamlessly integrated into the presentation of your instruction. Every look, face, smile, gesture matters in teaching behavior. As you’ve mentioned, standing ground of expectations and putting students first is a priority. My point is simply that putting academic content ahead of students as learners and people may yield less production and progress than vice versa. There are limitations and frustrations with both ways; however, in my experience, one tends to lead to passion overcoming those limitations and frustrations, while the other tends to lead to the opposite.